One of the daily frustrations of physicians is dealing with “prior authorizations”. When I write a prescription for a medication for my patient, it generally means my patient needs that medication. In an effort to hold down costs, prescription services and Medicaid require prior authorization for some medications; they want justification for using this particular drug rather than one on their “preferred” list. This process may involve a long telephone call, printing out a form and filling it out by hand, or sometimes just submitting it via internet. In private practice, this may take up a couple of hours a day for the busy office nurse. 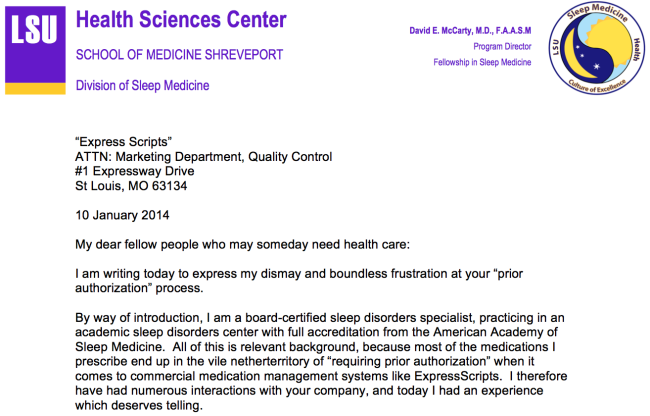 At LSUHSC, the physician must deal with this. 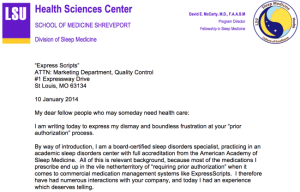 This entry was posted in Medicine, Uncategorized and tagged Express Scripts, LSUHSC, Medicaid, Prior authorization. Bookmark the permalink.